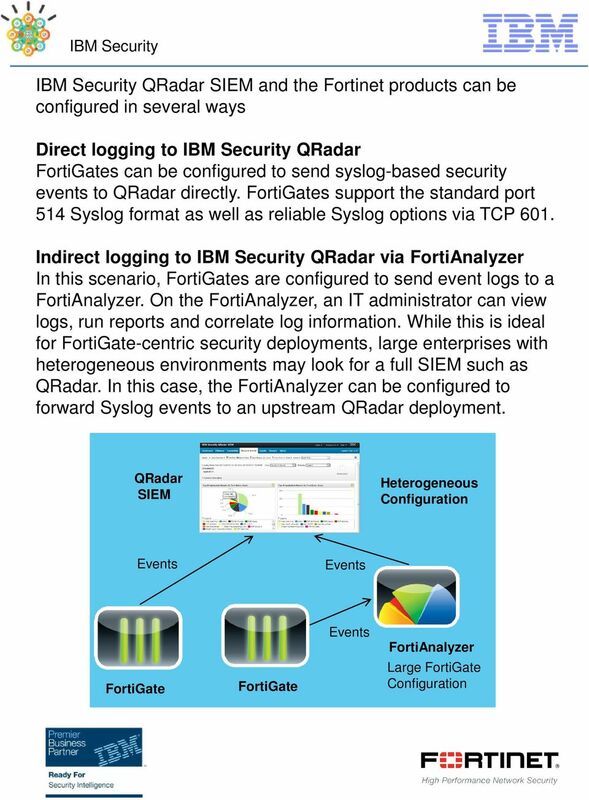 Download "IBM Security QRadar SIEM & Fortinet FortiGate / FortiAnalyzer"
1 IBM Security QRadar SIEM & Fortinet / FortiAnalyzer Introducing new functionality for IBM QRadar Security Intelligence Platform: integration with Fortinet s firewalls and logs forwarded by FortiAnalyzer. 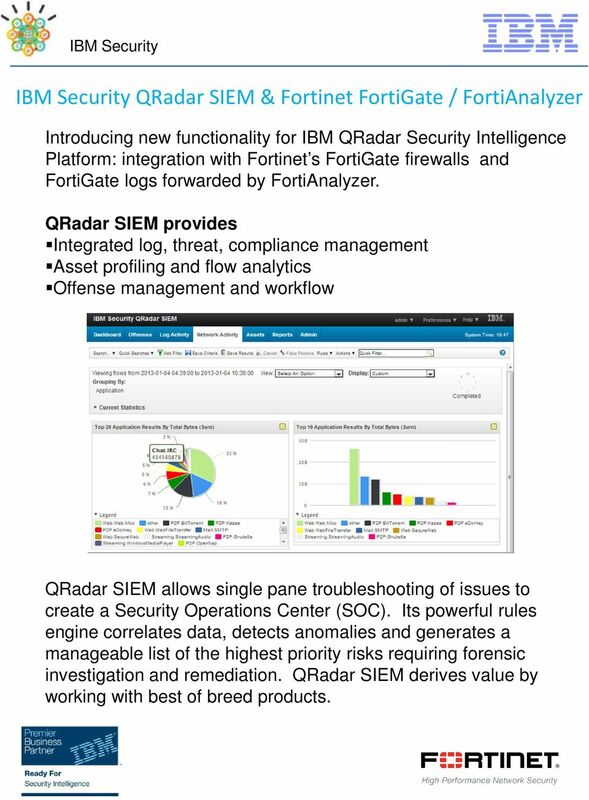 QRadar SIEM provides Integrated log, threat, compliance management Asset profiling and flow analytics Offense management and workflow QRadar SIEM allows single pane troubleshooting of issues to create a Security Operations Center (SOC). Its powerful rules engine correlates data, detects anomalies and generates a manageable list of the highest priority risks requiring forensic investigation and remediation. QRadar SIEM derives value by working with best of breed products. 5 endpoints that need to be cleaned and prioritizes them based on the asset weight, which reflects the business importance. 3. DoS attack stopped The network administrators at a national bank go on alert when they see a DoS attack offense on their QRadar dashboard. Based on the offense, the administrator sees the DoS event and the flows and network traffic that triggered the offense. She reacts immediately to write a rule for her IPS that will block such traffic, and stops the attack. These examples show how QRadar can leverage the value of best of breed products customers have already invested in throughout their infrastructure and enable them to reach their compliance and security goals. 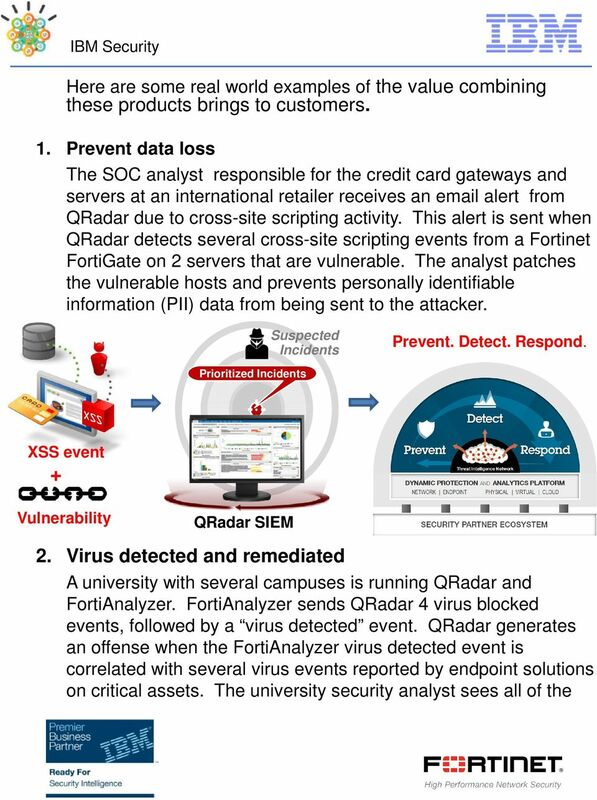 Integrating and FortiAnalyzer with QRadar enables data centers, enterprises and small to medium size businesses to improve their security posture and protect their organization from malware and viruses, application vulnerabilities, data loss, spam, and other threats. 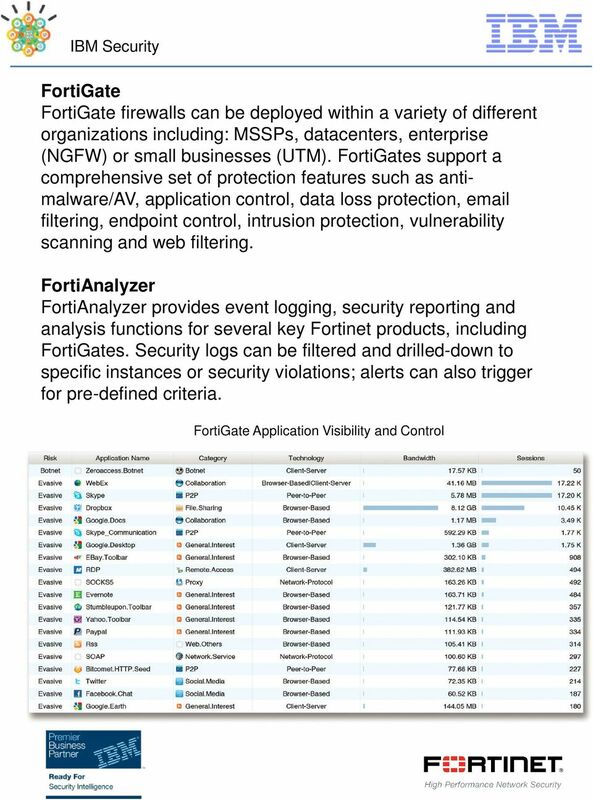 www.encari.com Using Monitoring, Logging, and Alerting to Improve ICS Security ICSJWG 2015 Fall Meeting October 27, 2015 www.encari.com 2 The Problem Cyber attacks are not just a risk, they are a reality. Unit 3 Research Project. Eddie S. Jackson. Kaplan University. IT540: Management of Information Security. Kenneth L. Flick, Ph.D.